"How do I make a dvd menu using Windows Live Moviemaker? – So I’m doing a slide-show for a family thing with music, videos, and pictures but I want to include a menu like you would find on a DvD. This includes background pictures, music, possibly video, and several choices, such as play now, scenes, etc. Can I do this using Windows Live Moviemaker? I cannot afford super programs that do this, so if I cannot do this on this program, does anybody know of any free ones that I could do it on. I do have Convert-X-Dvd, and I know you can make menus with this, but it would mean I don’t use original video and would have to run the whole thing through convert-x. Any help would be appreciated." Many people would like to use Windows Movie Maker for editing, creating movies and burning movies to DVD content. Acutally, Windows Live Movie Maker is simply a movie editing software program. It can’t be used to create DVD content and make DVD menu. 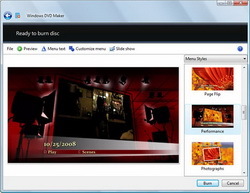 You can simply publish your video or slideshow video file as an AVI or WMV video file within Windows Live Movie Maker, then use a DVD menu creator program to create/burn a video DVD with DVD menu from the WMV or AVI video file. This tutorial would show you how to create a DVD menu with expert DVD menu creator during burning video to DVD in different ways. You could learn these ways and then determine which solution to make use of. Microsoft has built in some effective solutions for you to create DVD menu via its internal free DVD menu creator – Windows DVD Maker. 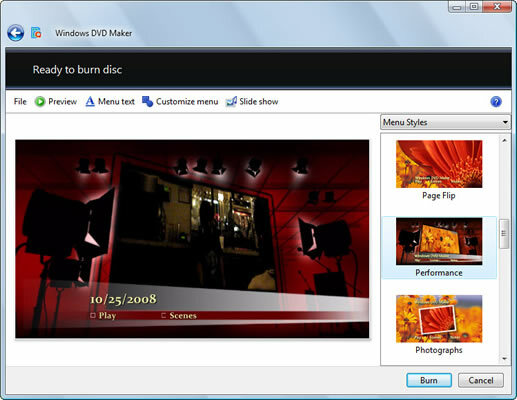 Windows DVD Maker is a DVD authoring utility developed by Microsoft for Windows Vista and included in Windows 7 that allows users to create DVD slideshows and videos for playback on media devices such as a DVD player. 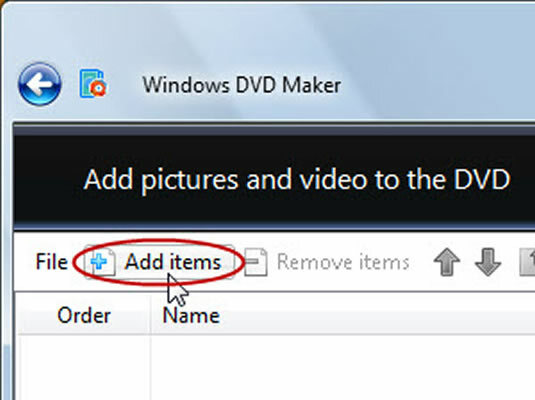 DVD Maker has been removed as of Windows 8. Therefore, if you are using a Windows 8 computer, you need to skip to the Part 2. Video files: ‘.asf’, ‘.avi’, ‘.dvr-ms’, ‘.m1v’, ‘.mp2′, ‘.mp2v’, ‘.mpe’, ‘.mpeg’, ‘.mpg’, ‘.mpv2′, ‘.wm’, and ‘.wmv’. Audio files: ‘.aif’, ‘.aifc’, ‘.aiff’, ‘.asf’, ‘.au’, ‘.mp2′, ‘.mp3′, ‘.mpa’, ‘.snd’, ‘.wav’, and ‘.wma’. Picture files: ‘.bmp’, ‘.dib’, ‘.emf’, ‘.gif’, ‘.jfif’, ‘.jpe’, ‘.jpeg’, ‘.jpg’, ‘.png’, ‘.tif’, ‘.tiff’, and ‘.wmf’. 1. Launch Windows DVD Maker (you could open the Start menu and then start Windows DVD Maker from All Program option). 2. Click “Add Items” button to browse and add videos. Then click “Next” button. 3. You could select a disc menu and customize it if you like. Adding your favorite song as background music is allowed. 4. Insert blank writable DVD disc into the recorder drive. 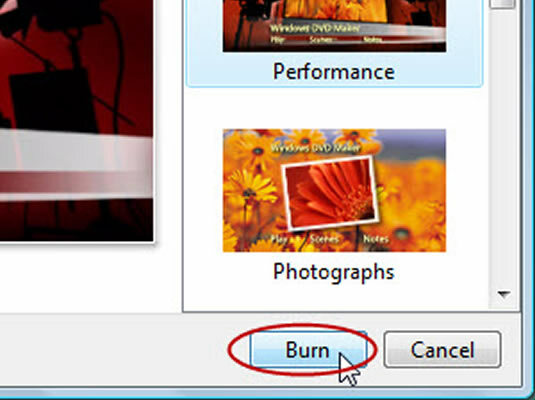 Click the “Burn” button to start burning video to DVD with DVD menu. To set the DVD video options like DVD playback settings, DVD aspect ratio (16:9 or 4:3), DVD video format (NTSC or PAL), DVD burner speed, etc., you need to click the “Options” button after you import video into Windows DVD Maker. In Step 3, you could create a DVD menu within this free DVD menu creator by changing Menu Text, Customize Menu, Slide Show, and Menus Styles, including text font, color, content, buttons, notes, button styles, background/foreground video, etc. We all know that Windows DVD Maker is no more available on Windows 8, and it also has no Mac version. Apple’s iDVD is also removed in the latest Mac OS version. Is there an alternative to Windows DVD maker that could performs even better than Windows DVD Maker in creating DVD menu during video to DVD making? Of course yes. 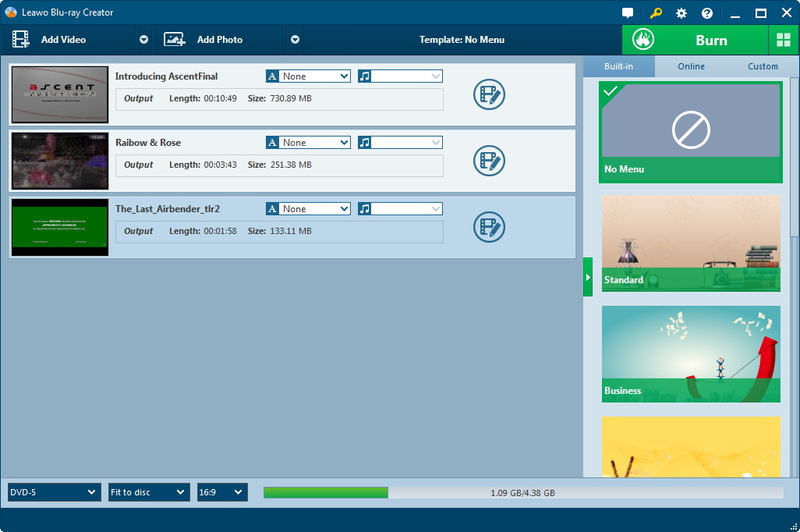 Leawo Blu-ray Creator is the best DVD menu creator that could help you easily convert and burn any video to DVD content with a built-in DVD menu maker to create DVD menu freely. Why is Leawo Blu-ray Creator the Best DVD Menu Creator? 1. Accepts more video formats than that of Windows DVD Maker. Recognize 180+ formats like M4V, MP4, AVI, FLV, etc. for burning to Blu-ray/DVD disc, folder and/or ISO image file. 2. Multiple preset disc menu templates to select. Download more disc menu templates at will. Preview disc menu via the built-in player. 3. Create disc menu via the internal DVD menu maker, like adding background music/image/video, changing title position and content, text color, text font, text size, edit chapters and menu, etc. 4. Edit source video files like adding image or text watermark, trimming video length, cropping video size, changing video effect, rotating videos, adding 3D effect, etc. 1. Click the "Add Video" buttun to browse and add source videos. Insert a blank writable disc into recorder drive. Set disc type (according to the disc insert to the drive), quality and aspect ratio at the bottom. 2. 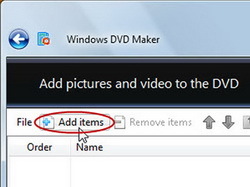 On the right sidebar, select a disc menu template for adding to output DVD. Click the middle of the selected disc menu template to get instant preview. 3. Click the pencil icon on the preview panel. There you could rename titles, adjust the title position and content, text font, size and color, load background image/video/audio, edit the content on chapter list pages, etc. 4. Click the big green "Burn" button to set "Burn to", "Disc Label" and "Save to" options. Click the top-right wheel icon for program settings. 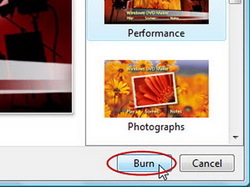 Finally, click the bottom "Burn" button to start DVD burning. To burn video to DVD disc, insert a blank writable DVD disc into the recorder drive first, set output disc type according to the inserted disc at the bottom in Step 1, set the inserted disc as target under "Burn to" option in Step 4. You are able to set the output DVD video mode from PAL and NTSC on the program setting panel (by clicking the wheel icon on the top-right corner). 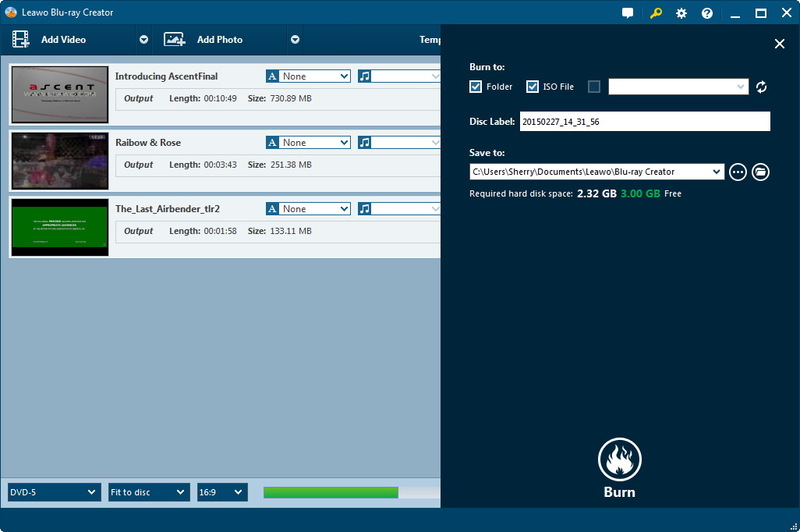 Leawo Blu-ray Creator has both Windows and Mac versions. The Mac versions is similar to the Windows version in program interface and operation. For a better understanding of how to create a DVD menu with Leawo Blu-ray Creator, you could refer to the below video demo, which shows you using Leawo Blu-ray Creator in details.